28 in. x 12 in. Alley Oop is the title character in a syndicated comic strip created in 1932 by American cartoonist V. T. Hamlin, who wrote and drew Alley Oop through four decades for NEA (Newspaper Enterprise Association). Initially, Alley Oop was a daily strip which had a run from December 5, 1932 to January 3, 1933. Beginning August 7, 1933, the early material was reworked for a larger readership. A mix of adventure, fantasy and humor, the strip added a Sunday full page, on September 9, 1934. It also appeared in half page, tabloid and half tab formats, which were smaller and/or dropped panels. During World War II, the full page vanished due to the drive to conserve paper, and it was reduced to a third of a page. The comic strip revolves around the irrepressible Alley Oop, who travels from prehistoric Moo all the way to the 21st century in his friend Doc Wonmug's time machine. Other favorite regulars in the strip include King Guz and Queen Umpa (the king and queen of Moo), Oscar and Ava (assistants to Wonmug), and Ooola (Alley Oop's girlfriend). When V. T. Hamlin retired in 1971, his assistant Dave Graue took over. The last daily by Hamlin appeared December 31, 1972, and his last Sunday was April 1, 1973. 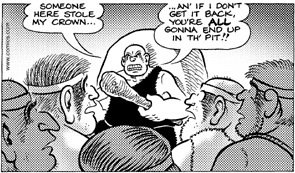 Graue wrote and drew the strip through the 1970s and 1980s until Jack Bender arrived in 1991. Alley Oop still appears, both Sunday and daily, written by Carole Bender and drawn by Jack Bender. 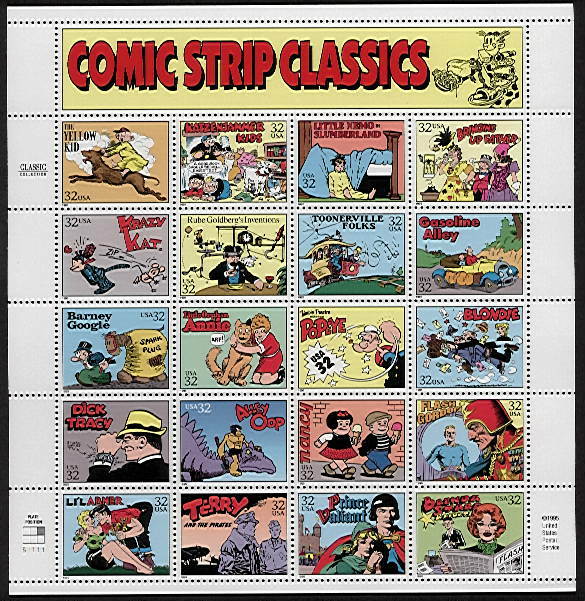 In 1995, the strip was one of 20 included in the Comic Strip Classics series of commemorative US postage stamps. Last Name: Gockel. First Name: Alfred. Paper Width: 27. 50. Paper Height: 12. 00. Subject: Humor. Style or Genre: Decorative. Decor: Contemporary. Primary Color: Wedgewood Blue. Secondary Color: Dark Gray.